zoopraxiscope modern movie technology was 1st displayed to audiences in Palo Alto! i learned this while researching the Palo Alto Int'l Film Festival that starts tonight. Governor Stanford wanted to see how horses 4 hoofs touched the ground in a run. Eadward Muybridge, father of the motion picture film, "invented his projection device, the Zoöpraxiscope, in summer 1879. This device built on a long global history of interest in image projection dating back to Plato, the Han dynasty and the Ancient Egyptians. However it also extended a strong 19th century interest in the phenomenon of vision itself, which had already resulted in the production of many new projection and moving image devices. In fact, Muybridge's Zoöpraxiscope served to amalgamate three existing visual technologies popular in the 19th Century: photography, the zoetrope and the magic lantern. Zoetropes (spinning drums) and phenakistiscope (spinning discs) had already produced a sort of pictorial animation, although the resultant moving image could not be projected. Conversely, magic lanterns had been projecting images ever since the 17th Century and had even begun to project photographs. But in this case truly lifelike motion had not been achieved. What Muybridge did was to borrow the animated illusion of movement from moving image toys and combine this with the capacity for projection embodied in the magic lantern. He then adapted pictures from his motion photography and created a device which for the first time could project sequences of rapid movement informed by the camera onto a screen. To many theorists, the Zoöpraxiscope therefore represents a pivotal moment in the history of the moving image - a missing link between slide projection and cinema. 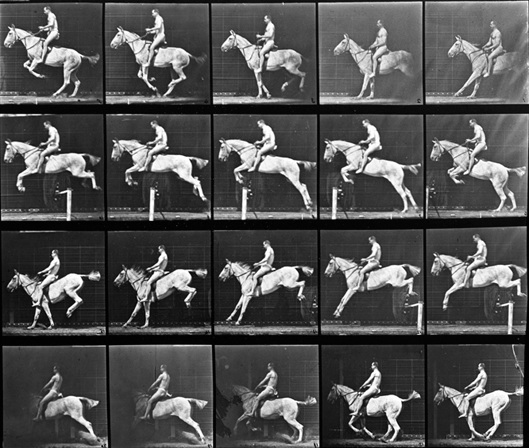 What the Zoöpraxiscope represented was an important progression in Muybridge's ongoing representation of motion and time. It reflects the beginning of a paradigm shift in the way modern time was being experienced and negotiated by artist and audience. This was a monumental development only fully realised with the rise of the motion picture film..."